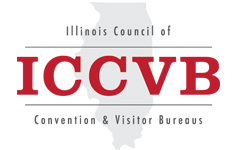 The Excellence in Tourism Awards are presented annually at the Illinois Governor's Conference on Travel and Tourism, which is co-hosted by the Illinois Department of Commerce and Economic Opportunity, Office of Tourism (DCEO/IOT) and the Illinois Council of Convention and Visitor Bureaus (ICCVB). Each year, information about the categories and the entry form are published on the conference website. Divisions within categories are based on budget size. The most recent award recipients appear below. For previous years, please select from the follow links: 2016 2015, 2014, 2013, 2012. The 2017 awards were presented Monday, March 20 at the DoubleTree Hotel, Springfield, Illinois. Please select this link to read more about the conference and awards.